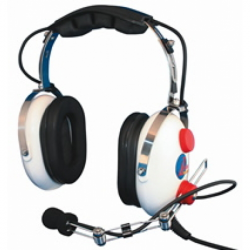 The AC-200FB PNR™ headset offers simple and affordable PNR™ (passive noise reduction) performance and is perfect for student pilots or extra an extra headset. Avcomm’s exclusive patented PNR™ audio technology features high efficiency ultra-lite speakers, Full FLEX BOOM, incredible voice clarity, higher noise attenuation, and lighter weight for improved comfort. New and more powerful, ultra-lite Neodymium speakers give you richer, smoother frequency response for both voice and music, while producing incredible efficiency that emphasizes higher frequencies. The powerful magnetic core and diaphragm are the perfect choice for higher sensitivity and optimized response.The speaker, a thin-lightweight 4/10th's of an ounce, reduces headset weight for added comfort. Audio performance notches up even higher with the advanced speaker installation technique that reduces internal ear cup vibrations while increasing noise attenuation.The AC200 PNR™ features an M65 microphone with a ceramic hybrid active filtering chip that amplifies desired voice signals while eliminating up to 75% of unwanted background noise so that you can be heard more clearly in even the noisiest of environments like open cockpits. 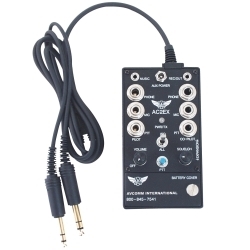 Additionally, the pre-amp circuit is immune to environmental changes, will not corrode, and has a much longer life than conventional PCB based products.Additional features include rugged stainless steel construction, easy-to-adjust headband, simple operation, volume control, an acoustic mic muff to protect the mic against moisture and wind noise, gold plated mic and headphone plugs, high impact ABS ear cups, durable copper wire with spiral shielding to eliminate RF interference and a polyurethane cover for added abrasion resistance and flexibility. Combining PNR technology with advanced performance features makes the AC200 PNR™ the best value on the market. Full five-year factory warranty. The AvComm AC-260 PNR™ with Avcomm's exclusive patented PNR™ (passive noise reduction) technology features a unique head band and wire boom made exclusively for children or adults with head sizes 53 cm or less. Adjust it small enough for a young child or expand it easily to fit smaller adults, or even add an optional full-size head band and ear seals for a full-size headset. 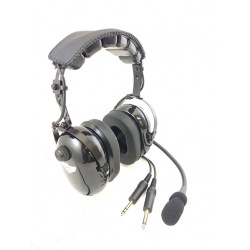 All Avcomm standard features are included, however the AC-260 headset is supplied with smaller ear seals for a closer fit and affords excellent noise attenuation to pro-tect sensitive ears. Also features a larger volume knob for easy use by children. Weighs only 428g (14.2 oz). 428g for a very light feel on your child's head. Constructed of rugged ABS plastic, the AC2EX is built to withstand the extremes a typical portable intercom encounters. Inside, a streamlined circuit board features ceramic hybrid IC chips for high reliability. The front panel features a logical layout that is easy to read with controls grouped conveniently above the battery compartment. For battery powered operation, simply open the easy-access battery compartment on the front panel and add two 9 volt batteries (one is required but two prolongs life). Measuring a mere 5.1" by 2.85", the AC2EX is designed to produce powerful communications you can depend on. 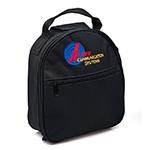 The compact design makes it easy to carry in your flight bag, a feature pilots who rent aircraft will especially appreciate. Need four positions? Simply add the AC-2XM module to accommodate additional passengers. An integrated circuit allows you to use mono or stereo headsets. A two stage LED displays a green light when the power is on and yellow during radio transmission making a “stuck mic” easy to spot. The voice-activated squelch circuit (VOX) adjusts to a broad range of noise environments or can be set for a continuous open-mic condition. On the front panel there is a convenient push-to-talk button for the pilot. It has a pilot-priority feature to allow the pilot to override the co-pilot transmissions. Pilot isolate (ISO) provides exclusive pilot communications with the ATC, and the “fail-safe” feature supplies a direct connection to the aircraft radio in case the power supply to the intercom is disrupted. 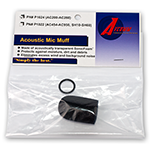 The AC2EX is equipped with a music-in jack for in-flight entertainment with automatic muting during intercom or radio activity (cable included). Add an audio recorder and with the record out feature, you can record ATC transmissions or cockpit conversations. AVCOMM’s AC2EX is a powerful, full featured, easy to expand, mono-stereo intercom. Full three-year factory warranty.